AP US History is a part of the history curriculum that covers the political, cultural and economic history of our country from 1492 to the present. 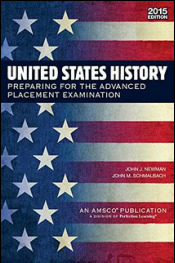 The APUSH curriculum is set up by the College Board and was redesigned in 2014-2015, with continued tweekings in 2015-2016. The AP Framework outlines the 7 major themes, the historical thinking skills and the key concepts for each time period. Our other textbook..link from Mr. Mikels page! Great resource for videos, primary sources and timelines.